Alessandro Scarlatti was one of the main Italian composers in the decades around 1700. His fame came primarily from his vocal works: operas, oratorios, serenatas and chamber cantatas. It seems that instrumental music played a minor role in his compositional activities. His oeuvre includes some pieces for instrumental ensemble; the best-known of these being twelve sinfonie di concerto grosso and some sonatas for recorder and strings. Keyboard works constitute the least-known part of his oeuvre and also the probably least-appreciated. The verdict of Malcolm Boyd in New Grove is telling: “One would hardly recognize the father of Domenico Scarlatti from the keyboard works that have survived, most of which seem to have acted as pupil fodder.” In contrast, the Canadian harpsichordist Alexander Weimann, in the liner-notes to the first volume of his planned complete recording (review), states that “as a composer for the keyboard, Alessandro Scarlatti (...) deserves the same respect that we show for his vocal works.” So far only two volumes in that project have been released. In addition single discs with Scarlatti's keyboard music have appeared, for instance from the Italian harpsichordist Rinaldo Alessandrini (Arcana, 1992). His colleague Francesco Tasini is a specialist in this repertoire: he is the editor of a complete edition of Scarlatti's keyboard works, which is published by Ut Orpheus Edizioni in Bologna; the first volume appeared in 2000. 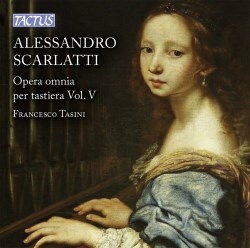 So far five discs have been released by the Italian label Tactus. In the liner-notes to the present disc he writes that with this volume "we are carrying on the project". This suggests that more is to come. Only a very small part of the keyboard oeuvre was published during Scarlatti's lifetime. Most pieces have survived in manuscript, and this makes it almost inevitable that some pieces are of doubtful authenticity. Copyists were not always sure about who was the composer of a specific piece. Because of that it is hard to know exactly how many pieces are really from Scarlatti's pen. Tasini is also preparing a thematic catalogue, and that will certainly shed more light on this matter. The present disc includes several pieces which are spurious and even some which were definitely not written by Scarlatti, but are included here because they show similarities to his style. If one doesn't know any of Scarlatti's keyboard oeuvre, one is probably inclined to expect something like the sonatas of his son Domenico. Considering that some of them are quite virtuosic, they certainly show that the son got his talent from his father. Stylistically Alessandro's keyboard works belong rather to the 17th century. The frequent use of the form of the toccata attests to that. However, there are also some more modern pieces. That goes especially for several pieces in four movements which adopt the form of the trio sonata. Tasini suggests that they may in fact be transcriptions of pieces originally written for treble instruments and basso continuo. The disc opens with a piece in e minor which is called Toccata in the track-list. The fact that this word is put between brackets seems to indicate that in the source the piece comes without a title. I don't know why it is called a toccata; ‘sonata’ would probably be the most appropriate term here. There is no fundamental difference between this piece and the piece in F, called sonata (track 11). Two fugues (track 8) are certainly transcriptions. In this case they are taken from a vocal work: a mass, called Missa Ottoboniana, written by Scarlatti in the style of Palestrina and dating from the time when he was maestro di capella of the Royal Chapel in Naples. It is notable that the pieces on this disc, despite their stylistic similarity, show quite some differences. It is certainly not ‘more of the same’. The opening [Toccata] in e minor comprises three movements; the second (adagio) is dominated by a descending four-note figure. It ends with a minuet. Follia in d minor is a series of variations on a frequently-used subject. Scarlatti seems to have written three sets of such variations: one with 29 and one with 22 variations. The version included here comprises only four variations. The ensuing [Toccata] in d minor has an improvisatory character and comes very close to the 17th-century model of the toccata. The Toccata per Cembalo in D (track 7) consists of three sections; the second of which is a fugue. This piece includes various passages with pedal points. That makes it a logical decision to perform it on the organ, despite its title. The [Andante] in G is a splendid example of Scarlatti's mastery of counterpoint. This reminds me of some of Domenico's sonatas in slow tempi which are also well suitable for a performance on the organ. Tasini rightly points out that “the organ and the harpsichord were traditionally regarded as interchangeable”. Therefore the choice of instrument is up to the interpreter, on the basis of what he thinks works best. In every case I found the option of the organ very convincing. The benefit of the organ is the variety of colours due to the different registers the organist has at his disposal. Tasini has chosen an organ of 1836, built by Carlo Serassi, a member of a dynasty of organ builders who were active for about 150 years. This choice may surprise, but one of the features of the organs by the Serassi dynasty is that they kept the characteristics of the traditonal Italian organs, and the sound of this organ is very 'baroque', not fundamentally different from organs built in the 17th and early 18th centuries. Tasini is an outstanding interpreter. He uses the possibilities of the organ to the full. The fast movements are played with much zest and imagination; in the slow movements he creates a maximum of expression, partly through a creative use of the registers of the organ. The recording also leaves nothing to be desired. This is a splendid disc because of the music, the performance and the organ. That justifies its being labelled Recording of the Month. It would not surprise me if those who purchase this disc, want to have the previous volumes as well.